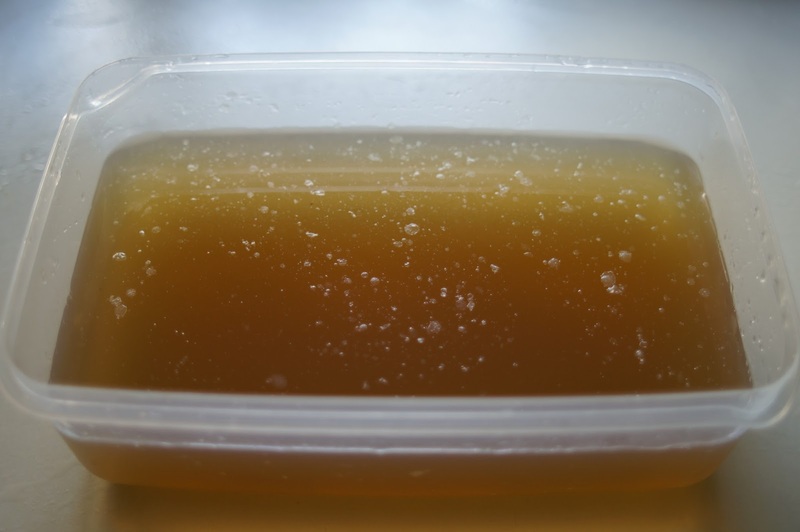 My mother often made stock at home, so I tried out making stock soon after I started cooking. Michael Ruhlman’s is by far the simplest and easiest stock recipe that I’ve found, and it has given me the best results so far. 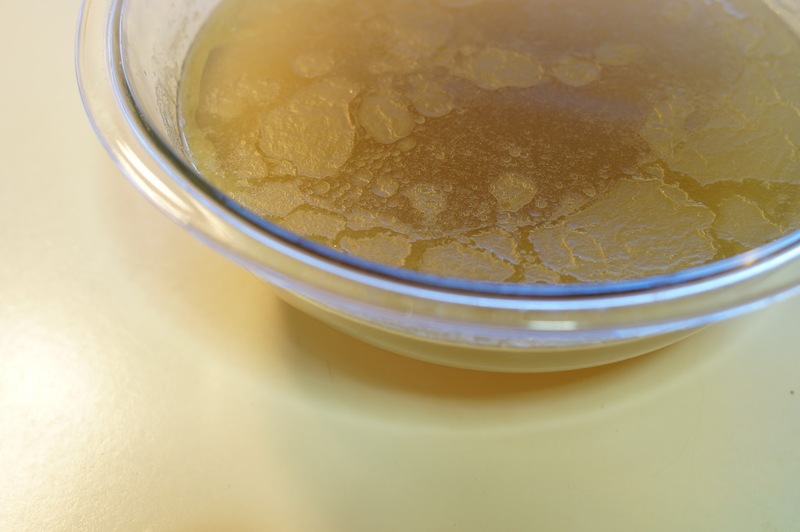 I used a combination of Michael Ruhlman’s chicken stock recipe on his blog, and the chicken stock recipe in “Ruhlman’s Twenty: 20 Techniques, 100 Recipes, A Cook’s Manifesto” and some other tips from recipes that I’ve read over the years. The difference between the two recipes is that in the book, he suggests chicken has cooked in water for several hours and then adding the vegetables and aromatics and then cooking for 1 hour more. On the blog, he cooks everything together. When you break down a chicken, you can save the spare parts (e.g. backbone), in a bag in the freezer until you have enough to make stock. You can also save the carcass from a roasted chicken to make a dark roast chicken stock, . Cooking the stock in the oven was a revelation to me! Stock should stay at a low simmer, it should not be allowed to come to a full boil because this will cause it to become cloudy. 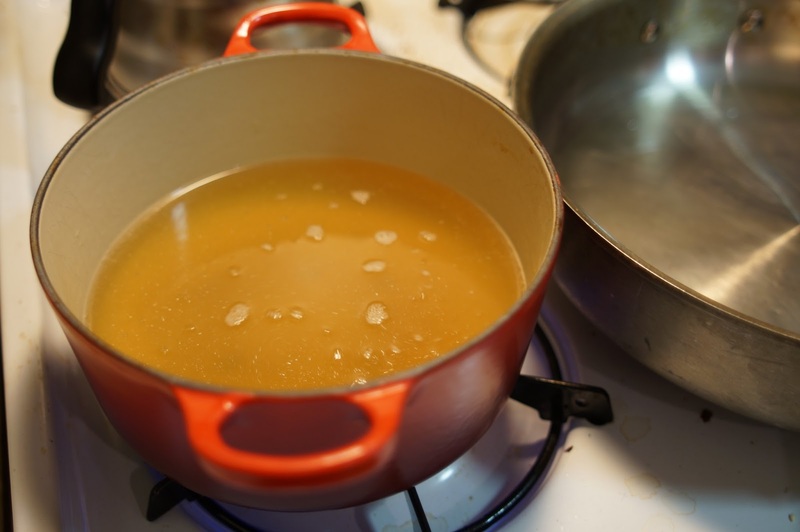 I find it difficult to make stock on the stove top, because the stock gets hotter and starts to boil when enough water evaporates, so I have to constantly adjust the heat. The oven required no adjustments in temperature, and I could just let it cook overnight while I slept. Mine cooked for 10 hours, which is the longest I’ve ever cooked a chicken stock; I used to think that you could only cook them for 2 hours maximum, since that’s how much time my other recipes suggested to cook chicken stock. Part of the reason this one needs to cook a minimum of 4 hours is because the temperature is so low. Don’t add more then a few stalks of celery; celery actually has a strong flavor, so if you add too much, you will make celery stock, not chicken stock. 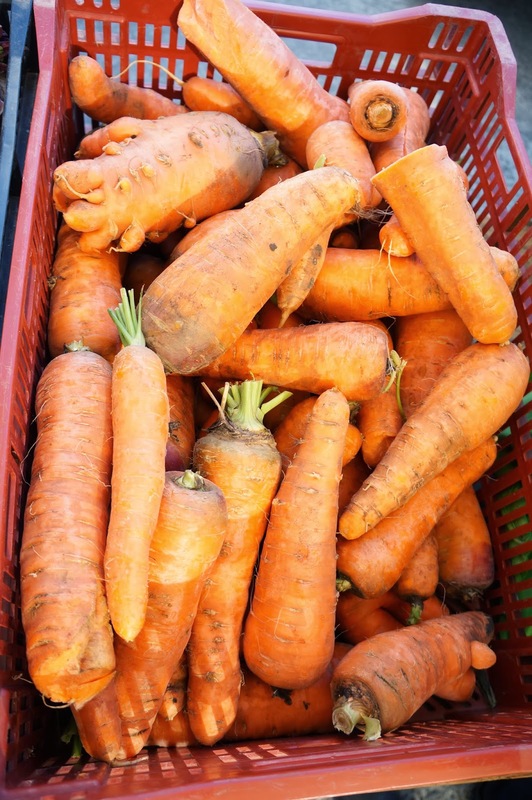 Only add 1 or 2 carrots, since carrots are sweet and too many carrots will make your stock sweet. You can also add parsley stems (don’t add the leaves because it will turn the stock green), tomato skins or a very small amount of tomato (too much tomato will color the stock). In addition, this is the clearest stock that I’ve ever made! Even though I know that the stock shouldn’t be boiled, what I thought was a “low simmer” on the stove top was actually too hot. This recipe showed me that the correct temperature is actually so low that you don’t see any movement or bubbles in the stock when it is cooking–but the oven will smell really nice from the chicken aromas. In the picture with many bowls on the second row in the middle, the bowls are the stock ingredients in a colander from the first straining to get the solids out of the broth, the murky residue that falls to the bottom of the stock that should be discarded when you pour the strained stock through cheesecloth to get out fine particles. After this the stock is refrigerated, so that the fat congeals and can be skimmed off, and then I pour all but the sediment once again into another bowl. * This technique of using the oven to maintain a low constant temperature can also be used for other types of stock. 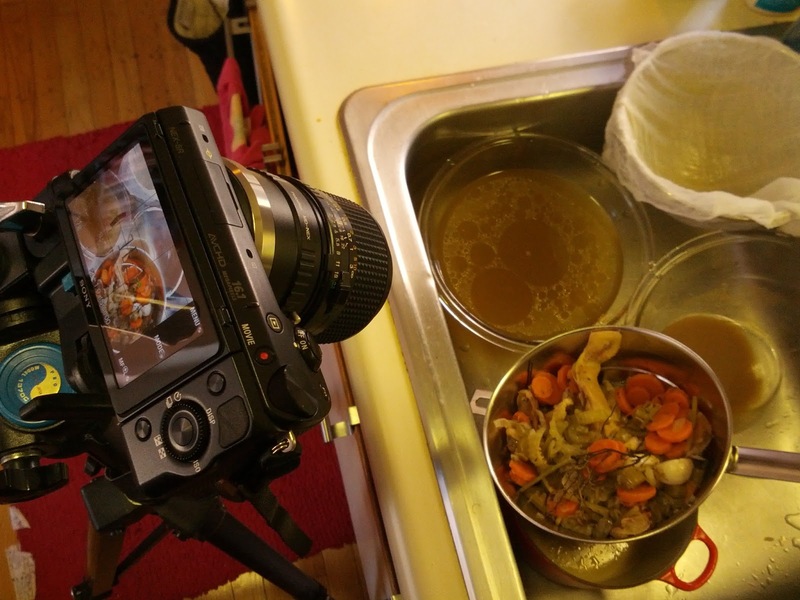 Adjust the total cooking according to the type of broth, e.g. usually fish, shrimp, and other seafood stock is cooked for a much shorter period of time (20 minutes to 1 hour though broths made from just lobster shells may be cooked for longer, possibly even hours). Source: “Easy Chicken Stock” from “Ruhlman’s Twenty: 20 Techniques, 100 Recipes, A Cook’s Manifesto” by Michael Ruhlman; the recipe is also available on his blog. Next time I make this, I should keep the vegetables in larger pieces (Michael Ruhlman uses large chunks, look at his blog post), since I think small pieces may make the stock cloudier. Preheat oven to 180 – 200 F.
Put all ingredients in a large oven-proof pot. Cover with water. Slowly bring the stock to a low simmer (but do not boil), skimming frequently to remove any impurities and grey scum that rises to the top. 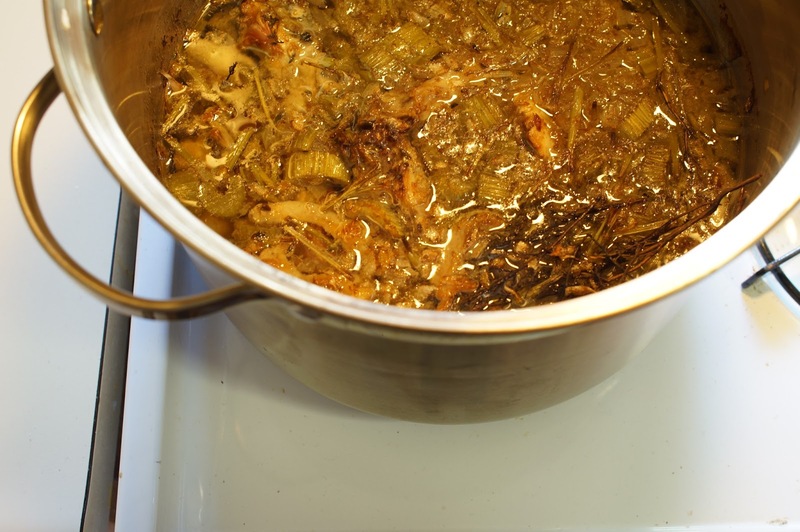 It is important to slowly bring the stock to a simmer in order to slowly bring out the impurities. It may take 20 minutes or more to bring the stock to a simmer at medium low heat. * Do not stir the stock–it may cause the stock to become cloudy. Move the pot into the oven. Let the stock cook in the oven for 4 – 12 hours uncovered (I let mine cook overnight.) Ideally the temperature of the stock should be about 180 F (it will be hot, but not visibly simmering; the surface of the stock will be still). Do not stir the stock pot while it is cooking. Remove the pot from the oven and let it cool slightly, so that it will be easier to handle. Strain to remove the solids. I actually strained this twice. First I used my fine meshed strainer (chinoise) to strain out the large solids. Thomas Keller says that pressing the solids can cloud the stock. So do not press the solids to extract more liquid–just let the strainer drip for several minutes. Second, I rinsed out the fine mesh strainer and lined it with cheesecloth. When I use dry cheesecloth with a strainer, the cheesecloth has a tendency to fall to the bottom of the strainer, no matter how large a piece of cheese cloth I seem to use, since I don’t clip it to the strainer. You can fix this by simply wetting the cheese cloth in the sink, and then running some water through it to check that it won’t fall down and crumple when you pour the stock through it. I poured the stock through the cheesecloth lined strainer to remove the small particles and grit that can cloud the stock or accumulate at the bottom of the stock. Finally, I put the stock in the fridge for several hours. Once the chicken fat had solidified, I skimmed off the chicken fat. You can keep the stock in a fridge for about a week if you are going to use it immediately. Otherwise, (and this is what I find easiest to do, since I don’t always know what i will use the stock for) you can freeze the stock and keep it frozen for months. When you reheat it, you may want to boil it for a few minutes to help kill any bacteria. It is okay to boil the stock now since it doesn’t have any solids. If the stock is too dilute, you can also boil it down. Also note that the stock does not have any salt in it yet, so it will taste bland. If you want to use it for chicken soup, you’ll need to salt it. 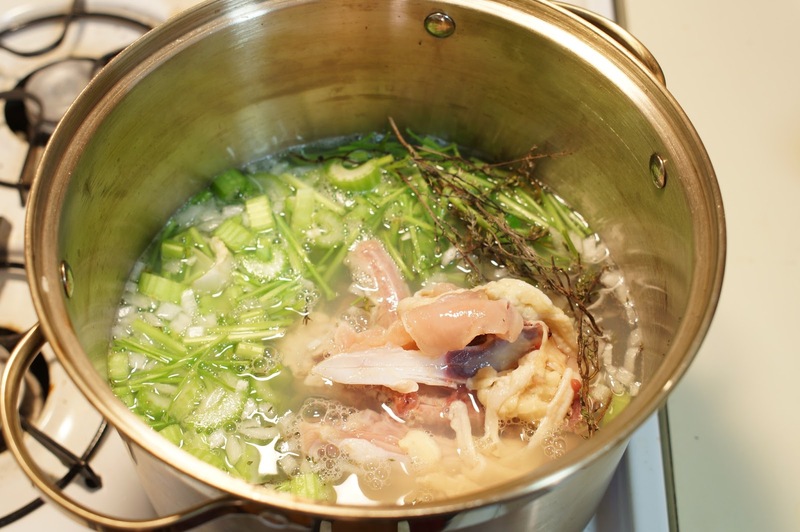 * In the recipe for “Chicken Stock” in “Bouchon”, Thomas Keller (with Jeffrey Cerciello, Susie Heller, and Michael Ruhlman) suggest beginning the stock with just chicken and water, since it is harder to skim once the vegetables are added since they tend to float on the top. 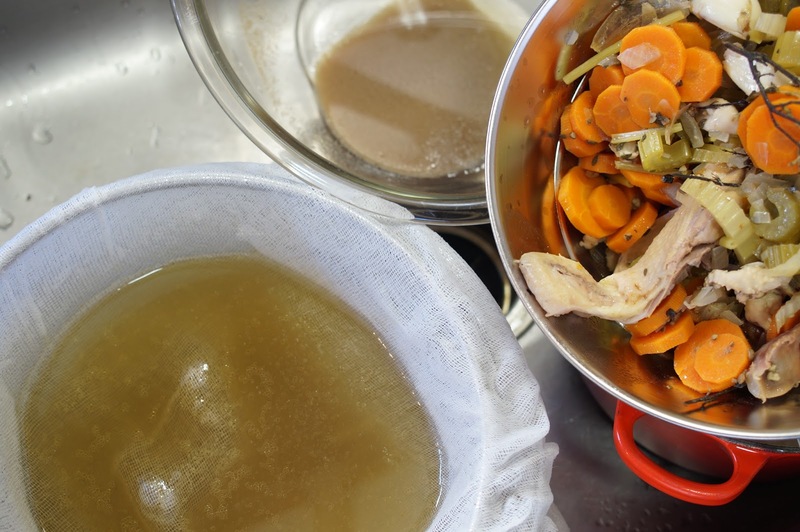 After the stock has been skimmed, the vegetables and more cold water is added to reduce the temperature, and then everything is slowly brought to a simmer again. I also find that the vegetables make skimming difficult, so this sounds like a great technique!